Belman designed and manufactured 3 refractory lined FCC expansion joints to suit the application at an oil refinery in the CIS. The expansion joints will be placed around the reactor and will carry mainly spent, regenerated, recirculation catalyst and flue gas. A short delivery time was essential for this project and Belman responded by producing all 3 units in an exceptionally short delivery time of 12 weeks. Belman made this possible by working around the clock and by choosing road transport to ensure the client received a fast, flexible and cost-efficient delivery. The rapid delivery was made without compromising on quality, documentation and project requirements. The materials, welding and test procedures were delivered according to ASME B31.3:2010. All 3 expansion joints were subjected to extensive NDT testing including 100% visual, 100% radiographic, 100% dye penetrant and hydraulic testing (however the hydraulic test was not made on the unit with refractory lining). Naturally the delivery took place with full traceability of all materials. The project concerned the modernisation of an old FCC unit. However, Belman started the project from scratch based on drawings of the current system. The clients engineering team additionally described the problems experienced when operating with the old solution, which mainly concerned the big movements resulting in sensitive nozzles. The plant requested Belman to find a suitable method to relieve the stresses placed on the nozzles. The solution was found in close cooperation with the client and based on Axens specifications, this was further combined with Belman’s experience and UOP’s practices. This mean the same approach as UOP by offering 2 ply bellows, whereby one layer is able to bear the full load. On the basis of our technical proposal the client (an engineering contractor) issued the project specification. As part of Belman’s engineering for this project we included Finite Element Analysis (FEA), bellow and part calculations and analysis of the stresses in the pipe line and the resultant loads on vessel nozzles. Due to the high temperatures, one of the expansion joints was refractory lined and the two other expansion joints were designed with soft insulation on the bellow. Heavy stresses on the bellows caused by high pressure, temperature and large movements make this component vulnerable, for this reason the expansion joints bellows were made from Inconel 625 LCF. The bellows were manufactured by punch forming. A design criteria required that the two-ply bellows had to be calculated so that the single layer would be able to carry the full load in the event of operating alone. In other words, if the inner layer failed, the outer ply would be able to secure operational safety of the expansion joint until a scheduled shutdown. Additionally, the expansion joints were fitted with a pressure gauge to indicate any possible failure of the inner ply of the bellow. 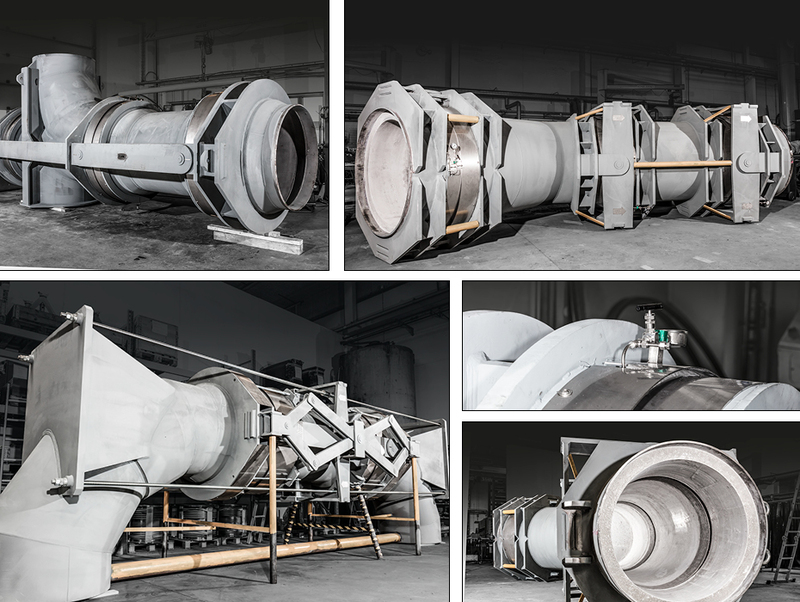 Belman is highly experienced in producing refractory lined expansion joints for both FCC and other critical applications in various types of plants. Upon request we can send reference lists for FCC expansion joints, refractory lined expansion joints for FCC and other industries, including also brick lined expansion joints.